Head Lice Treatment for Children | Kids' Hair Inc.
Nobody wants to hear their child has lice but unfortunately lice is still a common issue, especially among school-aged children. And, anybody can get lice, it doesn’t matter how clean your hair is! Use defense products: Just like you make sure your child has insect repellent on before going into a wooded area or sun-block lotion on before going to the beach, you can protect them during a lice outbreak with the right products. Haircare products that contain a concentrated amount of essential oils like mint or tea tree have been proven to repel lice. Kids’ Hair carries Ladibugs brand shampoo, conditioner and mint sprays. Talk to your kids: Make sure your kids develop good habits when it comes to all the sharing that goes on during school, camp or other activities where groups are together. Make sure they are not sharing items that touch hair including hats, brushes and combs, hair binders, headbands and even clothing items such as sweatshirts, jackets and scarves. 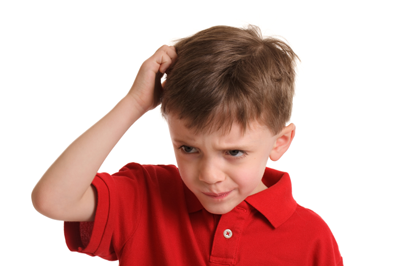 The most common indicator of lice is scalp irritation. Lice are nocturnal creatures, so itching might intensify or only happen at night. Small, red marks around the hairline may also be visible. Important – some do not experience any itching! So, if you get a note home from school or become aware of an outbreak, don’t wait until your child is complaining of itching. Be proactive and begin frequent head checks. It can be difficult to properly identify lice or nits, especially with kids and issues like dandruff, cradle cap or all that other stuff that can end up in a kid’s hair 🙂 The live louse bug can be hard to spot, so we recommend looking for nits first. Nits are tiny, tear shaped eggs that can range in color from translucent to dark brown and are attached securely to the hair strand. If it can’t be removed by flicking or brushing and literally has to be scraped off, it is very likely to be a nit. Also, many times there will be other nits nearby and all about 1/4-1/2 inch away from the scalp. Although they are harder to spot, you may be able to see adult lice in the hair, they are easiest to spot at the nape of the neck, the crown of the head or behind the ears. Once you know someone in your family has lice, your first step is to start frequent head checks of the other members of your household. It is not uncommon for siblings and parents to also contract lice. Until recently, the options in lice elimination have been limited. Traditionally, families have used over-the-counter, chemical based products that contain insecticides, known as pediculicides, that kill lice and nits. These products have been under growing scrutiny as lice are slowly becoming resistant to the active ingredients and as parents become increasingly uncomfortable with using high levels of pediculicide on their children. Alternative home remedies such as mayonnaise, olive oil and even alcohol have all been used with varying degrees of success. The important thing to remember when eliminating lice is that you have to get rid of the bugs and the nits. In recent years, professional small business entrepreneurs and FDA-approved treatment alternatives have been transforming the way we eliminate lice. Chemical-free products containing enzyme-based ingredients that remove nits and natural oils that effectively kill lice are finally available. 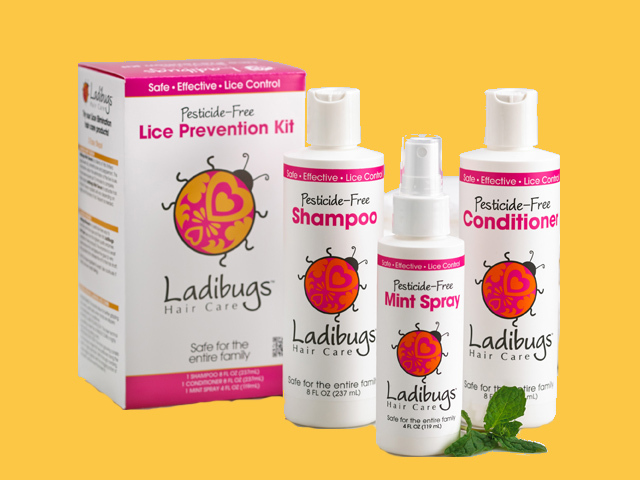 Kids’ Hair recommends and is a proud partner of Ladibugs, Inc. for the treatment of lice. 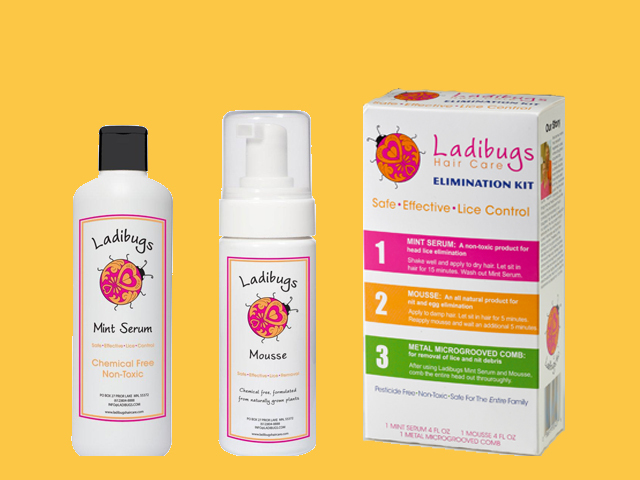 Ladibugs products use chemical-free ingredients and are safe for the entire family. Kids’ Hair carries all Ladibugs products, including the elimination kit. Please note: with any lice elimination product or process, the key to getting rid of the infestation is to follow the instructions carefully and be very thorough. The problem with getting rid of lice is that if one tiny bug or nit is left, it can cause a complete re-infestation. Whichever treatment you choose, make sure to follow the manufacturer’s directions closely. Ladibugs, Inc. also offers lice removal services. For more information, go to ladibugsinc.com or call 612-804-8888. Do a mental inventory of places your child has been or where they might have shed lice or nits: couch, carpets, beds, car seats etc..
Dry all linens, hats, coats, clothes and stuffed animals on high heat for at least 40 minutes. TRICK – if it isn’t dirty, don’t wash it. Water doesn’t kill lice, it is the high heat of the dryer that does. Non-washable items can be placed in sealed plastic bags for 48 hours. Small items can be placed in a plastic bag in the freezer for 12 hours. Vacuum all carpets, couches and car seats and wipe down all hard surfaces with a damp cloth. The best treatment for items and living spaces is isolation. Lice and nits die without a host after 48 hours. If there are areas of your home you can vacate for this time, vacuum them and tape them off for a minimum of 48 hours. Have pets? Don’t worry – animals cannot get human lice! Getting rid of lice needs to be a community-wide effort. Remember to be vocal, observant and to educate others. Be open with your school, family and friends if someone in your family has lice. It is nothing to be embarrassed or ashamed of. Also be frequent head checks during outbreaks and encourage other parents to do the same. Kids’ Hair is committed to continually educating and supporting our communities dealing with lice and are willing to help schools, PTAs and parent groups. If you have any questions or for more information please email tellus@kidshairinc.com or visit your local Kids’ Hair salon to talk to our stylists. They are lice experts. 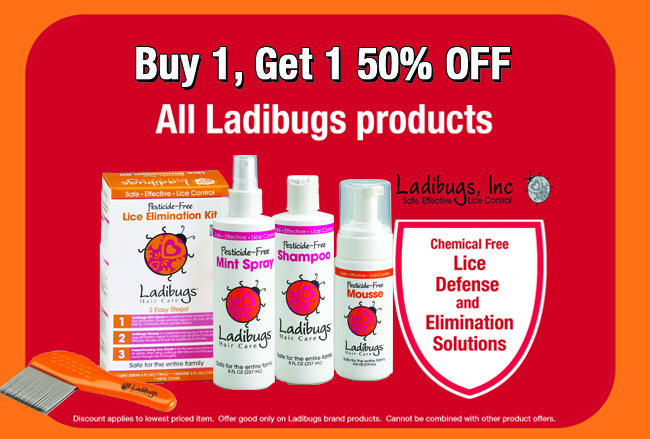 Ladibugs on sale through 2/3/19!